The Stoller Hall is located directly opposite Manchester Victoria station, within easy reach of all main train, bus, tram and road links. 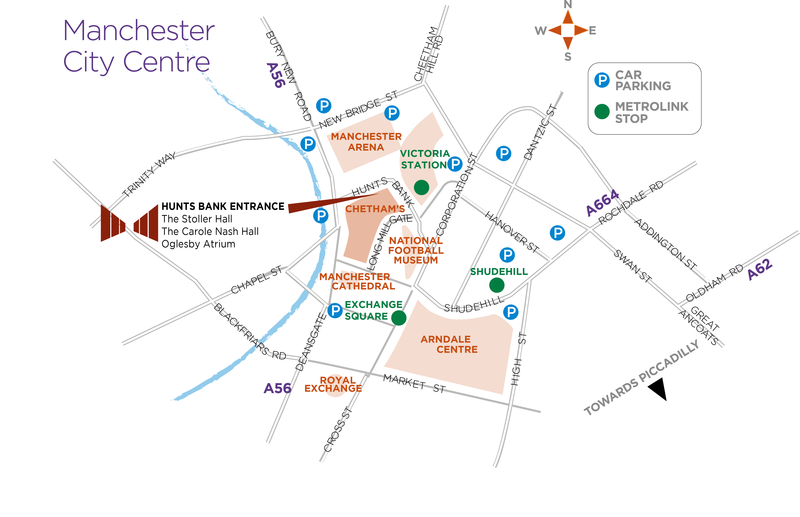 Audience access is via Hunt’s Bank, with the front doors facing Manchester Arena. The Carole Nash Hall and Oglesby Atrium are also accessed via Hunt’s Bank. School visitors and deliveries should use the main School entrance on Long Millgate. We are pleased to partner with Q-Park Deansgate North to offer discounted parking for all our visitors. With a discount voucher you can park for up to 8 hours in the indoor, multi-storey Q-Park for just £5. Click here for details on directions to the parking facility, which is open 24/7. To claim the discounted price, just collect a voucher from the Box Office during your visit and scan it when returning to the car park to pay. Q-Park offers 23 disabled spaces and 4 electric car charging points. There is a level journey of less than 400m from the carpark to The Stoller Hall via Victoria Street and Hunts Bank. Some of our visitors have told us that the carpark has been shut when they arrived. There are anti-speed barriers across the entrance; these will lift when you drive slowly towards them. The carpark remains open 24 hours a day. By train: The Stoller Hall is situated opposite Manchester Victoria station where direct services run from across the region. Manchester Victoria is a 10-minute direct tram journey from Manchester Piccadilly. By tram: Metrolink services connecting communities across Greater Manchester. The nearest stop to The Stoller Hall is Victoria Station. By bus: Many buses stop a few minutes’ walk from The Stoller Hall on Corporation Street and at Shudehill Transport Interchange. The central bus station at Piccadilly Gardens, and the coach station on Chorlton Street, are each a 10-15 minute walk or a short tram ride away.